Made in Furniture at DesignMarch 2014 in Harpa, Reykjavik. Nordic House, Reykjavik 2012. Competitions-Architecture in the Melting Pot. 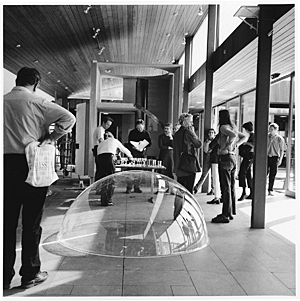 Exhibition of prizewinning proposals in open competitions over the last 40 years. Nordic Architecture as Resource , Reykjavík 2003. Garðhusabaer, The International Challenge, Reykjavik Art Museum, Reykjavik Arts Festival 2000. Hooks , Galleri Greip, Reykjavik Arts Festival 1996. From Dreams to Reality, the Baltic/Scandinavian Design and Craft exhibition . Tallinn, Riga, Vilnius, Gothenburg and Helsinki 1993-94. Arkitektinn sem hönnuður , Asmundarsalur, Reykjavik Arts Festival 1992.